But we missed to learn some details about shirt designs. There are lots to share; I explain that elaborately in a separate tutorial. Now we are going to see some basic and important points only. Choose your fabric pattern among strips, checked, plain, etc. to fix your shirt design. Now a days mostly designer shirt very popular among youngsters. 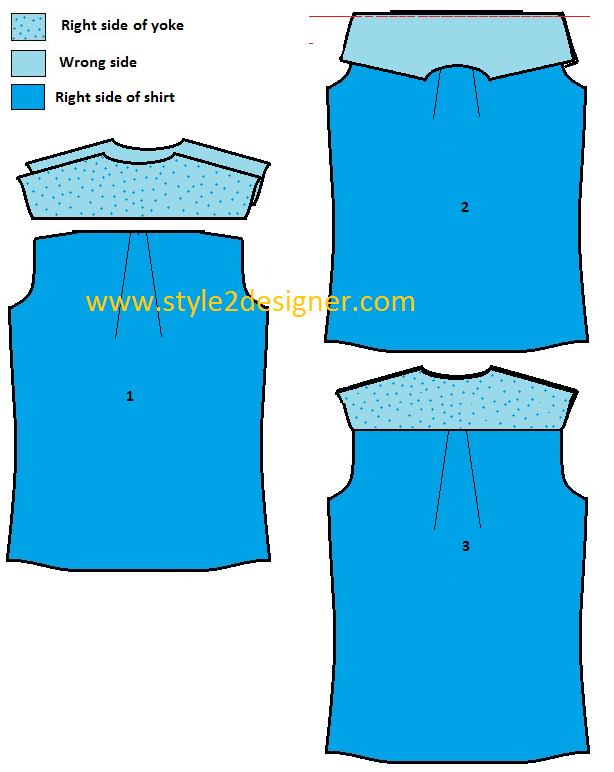 Pattern changing is advanced level, but you can design your own with this pattern draft also like changing color or fabric print or pattern for collar, pocket, button stand or buttonhole placket, cuff, yoke and hem lines by matching the main fabric. Beginners should leave extra seam allowance for ease sewing. Sew slowly and press the folds before top stitch and cut interlining in perfect size. First finish the small and easy parts one by one. Make your own order with notes to finish without any mess. Use over lock stitch for inside seams. Ok… That’s enough for now… we are ready to start sew shirt each part with separate detailed images… I hope these images are helpful to you all. 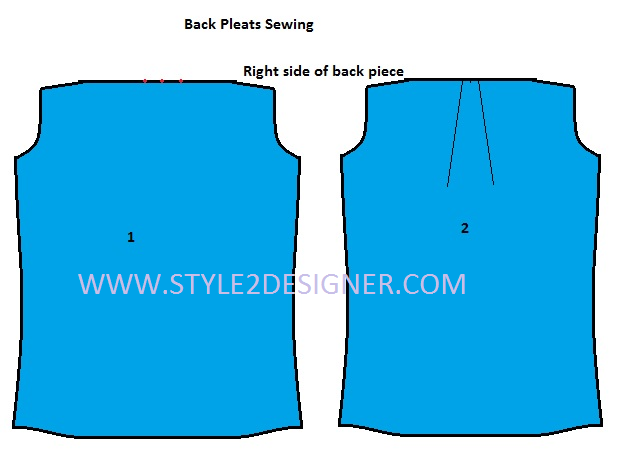 First we are going to start with left CF button hole placket. Place the interlining material(1” width) at the wrong side ¼” away from cutting edge and fold that ¼” towards interlining at the wrong side and press. Fold again the 1” with interlining at the wrong side and top stitch. Now mark for buttonhole, the first buttonhole is 2.75″ down from the top edge of buttonhole placket and each additional buttonhole is 3.5″ down from the buttonhole mark above it. Sew buttonholes with your buttonhole foot. Now buttonhole placket ready. Note: We can also do the above 3 & 4 steps at finishing stage. Next right CF button stand. Fold ¼” at wrong side from cutting edge and press. Again fold ¾” at the wrong side and top stitch. Repeat the step 3 of buttonhole placket to make mark for buttons. Fold ¼” fold again ½” seam allowances inwards and topstitch pocket mouth. Fold ¼” all other 3 sides and press. 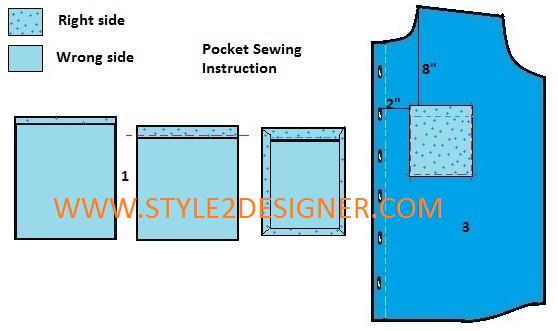 Pocket should be placed 2” away from second buttonhole and 7½” to 8” below from the neckline shoulder corner raw edge.Place to pin the pocket at right side of left front piece (refer picture) then sew with edge stitching it simultaneously. Now we are going to sew back piece pleats. First point out the center at top and mark 1”away from the two sides of center point. Make two ½” pleats. Refer above image. Take 2 yoke pieces and center pleated back piece. Place 2 yoke pieces facing right side together and insert back piece in middle of two yoke pieces (like sandwich). Then sew along ¼” away from the edges marked in image. Now turn the yoke pieces to the right side and press. Hi. Can i know if there is a tutorial after this? I have attached the yoke. Thank you.